Confessor, ecclesiastical writer, and founder of the Carthusian Order. 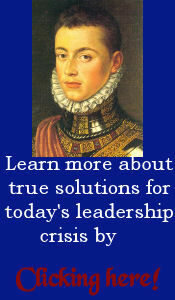 He was born at Cologne about the year 1030; died 6 October, 1101. He is usually represented with a death’s head in his hands, a book and a cross, or crowned with seven stars; or with a roll bearing the device O Bonitas. His feast is kept on the 6th of October. We have little information about the childhood and youth of St. Bruno. Born at Cologne, he would have studied at the city college, or collegial of St. Cunibert. While still quite young (a pueris) he went to complete his education at Reims, attracted by the reputation of the episcopal school and of its director, Heriman. There he finished his classical studies and perfected himself in the sacred sciences which at that time consisted principally of the study of Holy Scriptures and of the Fathers. He became there, according to the testimony of his contemporaries, learned both in human and in Divine science. His education completed, St. Bruno returned to Cologne, where he was provided with a canonry at St. Cunibert’s, and, according to the most probable opinion, was elevated to the priestly dignity. This was about the year 1055. In 1056 Bishop Gervais recalled him to Reims, to aid his former master Heriman in the direction of the school. 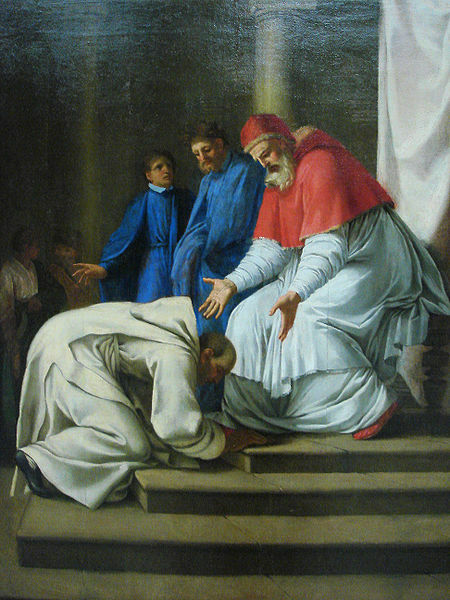 The latter was already turning his attention towards a more perfect form of life, and when he at last left the world to enter the religious life, in 1057, St. Bruno found himself head of the episcopal school, or écolâtre, a post difficult as it was elevated, for it then included the direction of the public schools and the oversight of all the educational establishments of the diocese. For about twenty years, from 1057 to 1075, he maintained the prestige which the school of Reims has attained under its former masters, Remi of Auxerre, Hucbald of St. Amand, Gerbert, and lastly Heriman. Of the excellence of his teaching we have a proof in the funereal titles composed in his honour, which celebrate his eloquence, his poetic, philosophical, and above all his exegetical and theological, talents; and also in the merits of his pupils, amongst whom were Eudes of Châtillon, afterwards Urban II, Rangier, Cardinal and Bishop of Reggio, Robert, Bishop of Langres, and a large number of prelates and abbots. 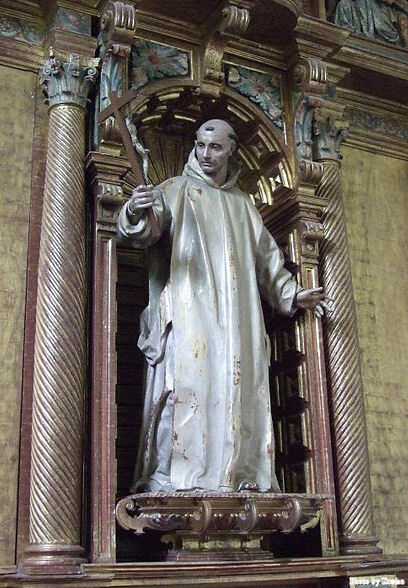 In 1075 St. Bruno was appointed chancellor of the church of Reims, and had then to give himself especially to the administration of the diocese. 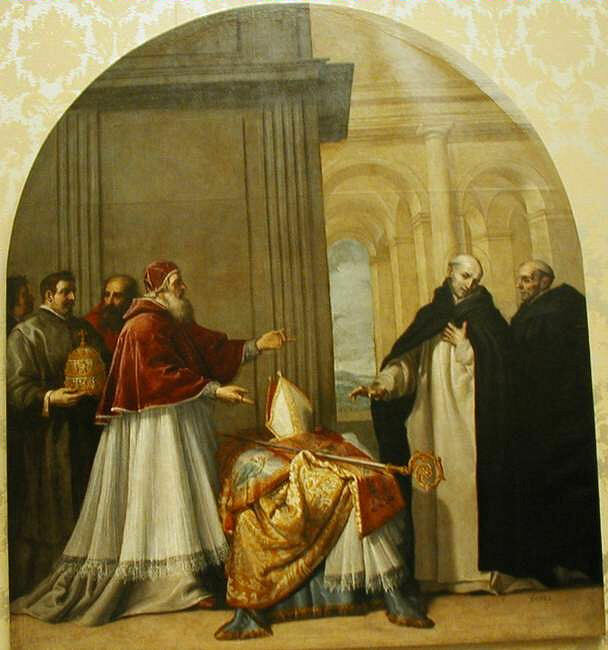 Meanwhile the pious Bishop Gervais, friend of St. Bruno, had been succeeded by Manasses de Gournai, who quickly became odious for his impiety and violence. The chancellor and two other canons were commissioned to bear to the papal legate, Hugh of Die, the complaints of the indignant clergy, and at the Council of Autun, 1077, they obtained the suspension of the unworthy prelate. The latter’s reply was to raze the houses of his accusers, confiscate their goods, sell their benefices, and appeal to the pope. Bruno then absented himself from Reims for a while, and went probably to Rome to defend the justice of his cause. It was only in 1080 that a definite sentence, confirmed by a rising of the people, compelled Manasses to withdraw and take refuge with the Emperor Henry IV. Free then to choose another bishop, the clergy were on the point of uniting their vote upon the chancellor. He, however, had far different designs in view. According to a tradition preserved in the Carthusian Order, Bruno was persuaded to abandon the world by the sight of a celebrated prodigy, popularized by the brush of Lesueur—the triple resurrection of the Parisian doctor, Raymond Diocres. To this tradition may be opposed the silence of contemporaries, and of the first biographers of the saint; the silence of Bruno himself in his letter to Raoul le Vert, Provost of Reims; and the impossibility of proving that he ever visited Paris. He had no need of such an extraordinary argument to cause him to leave the world. Some time before, when in conversation with two of his friends, Raoul and Fulcius, canons of Reims like himself, they had been so enkindled with the love of God and the desire of eternal goods that they had made a vow to abandon the world and to embrace the religious life. This vow, uttered in 1077, could not be put into execution until 1080, owing to various circumstances. Statue of Saint Bruno meditating on death. The statue is at the Royal Academy of Fine Arts of San Fernando in Madrid. During the voyage, the former professor of Reims attracted the attention of the clergy of Reggio in further Calabria, which had just lost its archbishop Arnulph (1090), and their votes were given to him. The pope and the Norman prince, Roger, Duke of Apulia, strongly approved of the election and pressed St. Bruno to accept it. In a similar juncture at Reims he had escaped by flight; this time he again escaped by causing Rangier, one of his former pupils, to be elected, who was fortunately near by at the Benedictine Abbey of La Cava near Salerno. But he feared that such attempts would be renewed; moreover he was weary of the agitated life imposed upon him, and solitude ever invited him. He begged, therefore, and after much trouble obtained, the pope’s permission to return again to his solitary life. His intention was to rejoin his brethren in Dauphiné, as a letter addressed to them makes clear. But the will of Urban II kept him in Italy, near the papal court, to which he could be called at need. The place chosen for his new retreat by St. Bruno and some followers who had joined him was in the Diocese of Squillace, on the eastern slope of the great chain which crosses Calabria from north to south, and in a high valley three miles long and two in width, covered with forest. The new solitaries constructed a little chapel of planks for their pious reunions and, in the depths of the woods, cabins covered with mud for their habitations. A legend says that St. Bruno whilst at prayer was discovered by the hounds of Roger, Great Count of Sicily and Calabria and uncle of the Duke of Apulia, who was then hunting in the neighbourhood, and who thus learnt to know and venerate him; but the count had no need to wait for that occasion to know him, for it was probably upon his invitation that the new solitaries settled upon his domains. That same year (1091) he visited them, made them a grant of the lands they occupied, and a close friendship was formed between them. More than once St. Bruno went to Mileto to take part in the joys and sorrows of the noble family, to visit the count when sick (1098 and 1101), and to baptize his son Roger (1097), the future Kind of Sicily. 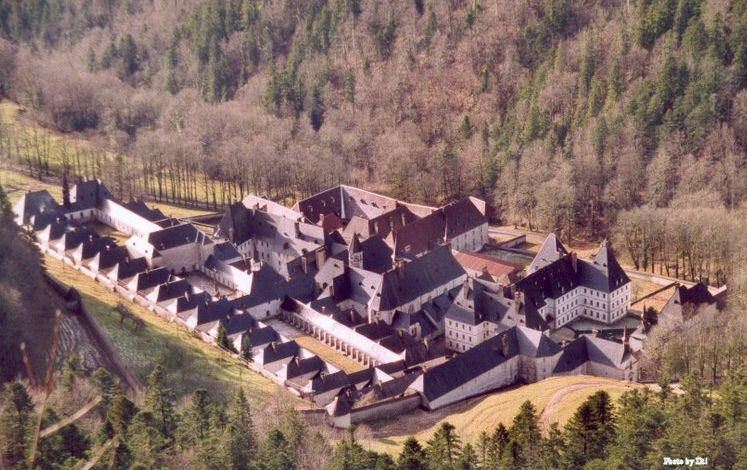 But more often it was Roger who went into the desert to visit his friends, and when, through his generosity, the monastery of St. Stephen was built, in 1095, near the hermitage of St. Mary, there was erected adjoining it a little country house at which he loved to pass the time left free from governing his State. Meanwhile the friends of St. Bruno died one after the other: Urban II in 1099; Landuin, the prior of the Grand Chartreuse, his first companion, in 1100; Count Roger in 1101. His own time was near at hand. Before his death he gathered for the last time his brethren round him and made in their presence a profession of the Catholic Faith, the words of which have been preserved. He affirms with special emphasis his faith in the mystery of the Holy Trinity, and in the real presence of Our Saviour in the Holy Eucharist—a protestation against the two heresies which had troubled that century, the tritheism of Roscelin, and the impanation of Berengarius. After his death, the Carthusians of Calabria, following a frequent custom of the Middle Ages by which the Christian world was associated with the death of its saints, dispatched a rolliger, a servant of the convent laden with a long roll of parchment, hung round his neck, who passed through Italy, France, Germany, and England. He stopped at the principal churches and communities to announce the death, and in return, the churches, communities, or chapters inscribed upon his roll, in prose or verse, the expression of their regrets, with promises of prayers. Many of these rolls have been preserved, but few are so extensive or so full of praise as that about St. Bruno. A hundred and seventy-eight witnesses, of whom many had known the deceased, celebrated the extent of his knowledge and the fruitfulness of his instruction. Strangers to him were above all struck by his great knowledge and talents. But his disciples praised his three chief virtues—his great spirit of prayer, an extreme mortification, and a filial devotion to the Blessed Virgin. 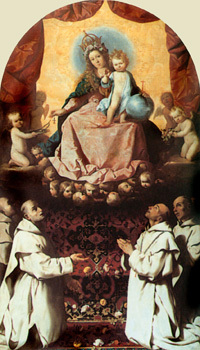 Both the churches built by him in the desert were dedicated to the Blessed Virgin: Our Lady of Casalibus in Dauphiné, Our Lady Della Torre in Calabria; and, faithful to his inspirations, the Carthusian Statutes proclaim the Mother of God the first and chief patron of all the houses of the order, whoever may be their particular patron. 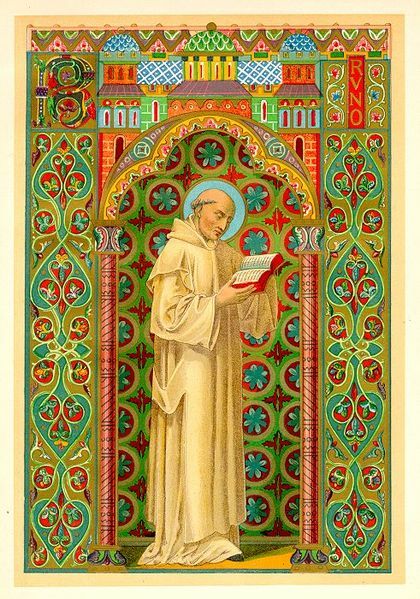 As a writer and founder of an order, St. Bruno occupies an important place in the history of the eleventh century. He composed commentaries on the Psalms and on the Epistles of St. Paul, the former written probably during his professorship at Reims, the latter during his stay at the Grande Chartreuse if we may believe an old manuscript seen by Mabillon—”Explicit glosarius Brunonis heremitae super Epistolas B. Pauli.” Two letters of his still remain, also his profession of faith, and a short elegy on contempt for the world which shows that he cultivated poetry. The “Commentaries” disclose to us a man of learning; he knows a little Hebrew and Greek and uses it to explain, or if need be, rectify the Vulgate; he is familiar with the Fathers, especially St. Augustine and St. Ambrose, his favourites. “His style”, says Dom Rivet, “is concise, clear, nervous and simple, and his Latin as good as could be expected of that century: it would be difficult to find a composition of this kind at once more solid and more luminous, more concise and more clear”. His writings have been published several times: at Paris, 1509-24; Cologne, 1611-40; Migne, Latin Patrology, CLII, CLIII, Montreuil-sur-Mer, 1891. The Paris edition of 1524 and those of Cologne include also some sermons and homilies which may be more justly attributed to St. Bruno, Bishop of Segni. The Preface of the Blessed Virgin has also been wrongly ascribed to him; it is long anterior, though he may have contributed to introduce it into the liturgy. St. Bruno’s distinction as the founder of an order was that he introduced into the religious life the mixed form, or union of the eremitical and cenobite modes of monasticism, a medium between the Camaldolese Rule and that of St. Benedict. He wrote no rule, but he left behind him two institutions which had little connection with each other—that of Dauphiné and that of Calabria. The foundation of Calabria, somewhat like the Camaldolese, comprised two classes of religious: hermits, who had the direction of the order, and cenobites who did not feel called to the solitary life; it only lasted a century, did not rise to more than five houses, and finally, in 1191, united with the Cistercian Order. 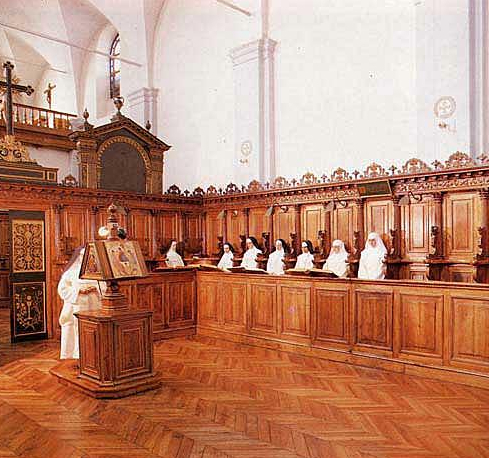 The foundation of Grenoble, more like the rule of St. Benedict, comprised only one kind of religious, subject to a uniform discipline, and the greater part of whose life was spent in solitude, without, however, the complete exclusion of the conventual life. 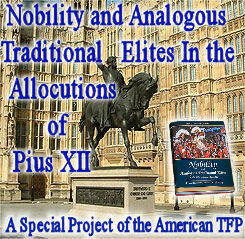 This life spread throughout Europe, numbered 250 monasteries, and in spite of many trials continues to this day. 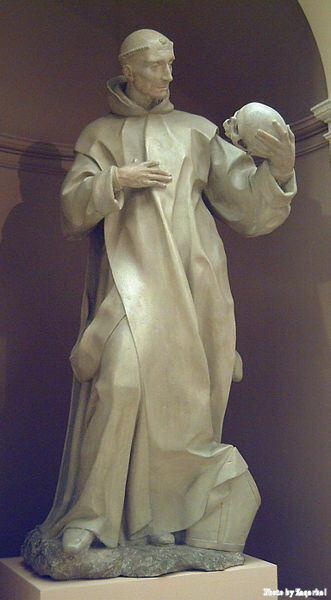 The great figure of St. Bruno has been often sketched by artists and has inspired more than one masterpiece: in sculpture, for example, the famous statue by Houdon, at St. Mary of the Angels in Rome, “which would speak if his rule did not compel him to silence”; in painting, the fine picture by Zurbaran, in the Seville museum, representing Urban II and St. Bruno in conference; the Apparition of the Blessed Virgin to St. Bruno, by Guercino at Bologna; and above all the twenty-two pictures forming the gallery of St. Bruno in the museum of the Louvre, “a masterpiece of Le Sueur and of the French school”. LE COUTEULX, Annales Ord. Cart., I; TROMBY, Storia del Sto Patriarea S. Brunone, I, II; Acta SS., 6 October; ZANOTTI, Storia di S. Brunone (Bologna, 1741); LEFEBVRE, Saint Bruno et L’Ordres des Chartreux (Paris, 1883); Vie de Saint Bruno, par un religieux de la Grand Chartreuse (Montreuil-sur-Mer, 1898); TAPPERT, Der heilige Bruno (Luxemburg, 1872); LÖBBEL, Der Stifter des Carthäuser Ordens (Münster, 1899); La Grande Chartreuse par un Chartreux (1896).